There’s little more one can say about a story once deemed unstageable by its author, which when adapted for the stage by Simon Stephens subsequently went on to win seven Olivier and five Tony Awards: this production of Mark Haddon’s, best-selling, award-winning, much-loved The Curious Incident of the Dog in the Night-Time has finally arrived in Glasgow and never has a show been more worthy of the superlatives thrown at it. Christopher, a young man with Asperger Syndrome sets out to solve the murder of his neighbour’s dog. And in the process uncovers some mysteries about his own dead mother while negotiating the vagaries of everyday interactions and human relationships. In order for Christopher’s internal monologue to be staged, Stephens frames the piece as a play based on Christopher’s writings. The action plays out on Bunny Christie, Finn Ross and Paule Constable’s stunningly inventive set – a black cube of brilliant light, sound, animation and design, where the workings of Christopher’s mind and the locations of the story are beautifully realised. The originality of the design has to be seen in action to be fully appreciated, safe to say it is one of the most mind-blowingly creative stagings you are likely to witness and the detail is seemingly infinite. The staging is enhanced with ingenious sequences of movement cleverly used to convey emotions and drive the narrative and a hauntingly evocative score by Adrian Sutton. The most stunning aspect of this production, though, is the central performance of Joshua Jenkins as Christopher. Words can’t begin to do justice to this young actor. Simply he is awe-inspiring and truly deserving of any plaudits that come his way. Haddon’s creation is hard not to love, but Jenkins makes him truly irresistible. This is a stunning piece of work and perfectly encapsulates the soaring originality of the book. One of the best things you are likely to see on a stage – as close to perfection as you could possibly get. 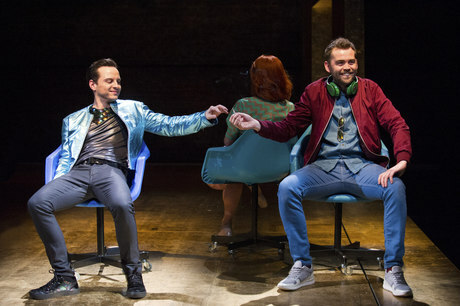 It’s universally acknowledged that absolute power has the ability to corrupt absolutely but in Simon Stephens’ new play Birdland, it’s absolute fame, seemingly limitless cash and a life lived so disconnected from reality that turns rock star Paul (Andrew Scott) into an amoral monster. Paul is a man on the edge. It’s the last few days of a nigh-on two year world tour and a return to “normal” life in London looms large. In the space of a few short years, the band has gone from playing to a handful of people in crummy clubs to international stadia, the money is rolling in (or rather the huge record company advance is), every whim is indulged and people fawn wherever they go. But what do you do when you have everything you’ve ever wanted? What do you do when you have lost all sense of who you are and home is an ever-fading memory? Well you alienate everyone around you (sleep with your best friends fiancée), make preposterous demands of hotel room service (ask for a single, locally sourced peach in a Russian hotel at midnight), humiliate your fans, take as many drugs as you humanly can, toy with journalists and on a visit to a deceased girl’s parents ask for a bigger and better brandy than the one they have given you. The story is a well-worn one: the destabilising effect of fame, and it draws much from playwright Simon Stephens own experiences in post-punk band The Country Teasers as well as classic rock documentaries. It also wears the influence of Bertolt Brecht’s Baal on its sleeve. There are plenty of examples of the foibles of rock stars throughout but for all the gasps of astonishment at Paul’s worst excesses there’s an overwhelming feeling that it breaks no new ground and could have been grittier and more dangerous. If we are being completely honest about this whole endeavour then we must acknowledge that the major selling point of the play is not writer Stephens but ‘frontman’ Andrew Scott. Indeed, such is his pulling power that the initial run was extended almost immediately after tickets sold out. Riding on a wave of success from his universally acclaimed role as Moriarty in Sherlock which was topped by a BAFTA win, there are flashes of the mercurial Moriarty in this portrayal of Paul; the same deadness behind the eyes, the same irresistible magnetism. He remains at all times throughout, mesmeric. For all Paul’s monumental arrogance, and at times abhorrent and cringe-inducing behaviour, there are flashes too of sensitivity and vulnerability, deftly handled by Scott, particularly in an affecting scene scene where Paul visits his father who has borrowed money from some internet ‘payday’ lenders to fix his boiler. Scott is excellently supported by his fellow cast members: Alex Price, Daniel Cerquiera, Nikki Amuka-Bird, Yolanda Kettle and Charlotte Randall most juggling multiple roles and all delivering knock-out performances in the process. Presented as a series of short sharp scenes, Carrie Cracknell’s sure-handed direction results in a seamless production and it’s complemented well by Ian MacNeil’s minimal design of a flat golden arch and an oily black moat which laps the edges of the set and slowly engulfs it as the play progresses. To his credit Stephens’ resists the urge to take the story full circle and provide a tidy ending for the audience. It’s not so much a cautionary tale about the excesses of fame, rather a mirror for those who attain it and what happens when we lose grasp of who we really are in the process. Essentially two plays with a London commonality, these works by the prolific writer Simon Stephens make a powerful impact but provide very different theatrical experiences. T5 opens on a lone woman (Abby Ford) in a hotel room, we watch as she acts out the innermost thoughts which are transmitted to us through a headset. Her movements as unpredictable as her quickly shifting thoughts, we sift through the random snippets to piece together why and how she is here. Witness to a fatal crime, but choosing not to intervene, her re-assessment of her life and her attempt to leave it, and London behind, seemingly the consequence of a guilt she can’t shake. While the headset transports us into the mind of the woman, the piece lacks the impact that directly addressing an audience has. Ford’s movements are too stylised to be believable and the piece feels more like a flight of fancy than a genuine journey into the mind of a troubled soul. The plays transition from one to another in the time it takes the audience to remove their headsets and the stage crew to quickly strip the set back to its bare bones. 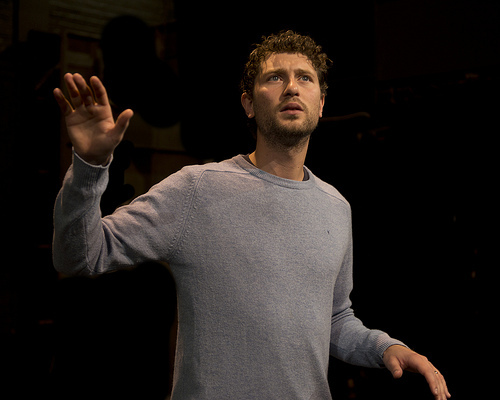 Actor Cary Crankson steps out and immediately begins to engage with the audience in the fully lit auditorium. Quickly drawing us in, he shares some amusing and well told anecdotes about his family, his job and the recent family holiday to visit his father-in-law in France. Despite the jovial banter there is a prevailing sense of unease throughout the monologue. Writer Stephens has an ear for narrative and tantalises us in the method of the storytelling, we watch, amused, engaged, but unsettled, and wait for the killer blow to be delivered, when the moment arrives its power has all the more impact. It is skilfully done, in the midst of the amiable chat it comes, in a few words, the gut-wrenching heart of the tale. At only half an hour in length, Sea Wall, packs an emotional punch and Crankson’s naturalistic delivery shows that the most truly powerful theatre comes from the ability of the actor to spellbind an audience with simple storytelling. Previously stand alone plays, the two work well staged as successive monologues providing an interesting theatrical contrast to one another, but it is the combination of Sea Wall and Crankson who are the stand-outs of the evening.